Dr. Scharf graduated in 2006 from the University of Waterloo (Dean’s Honour List). Through her university years she played varsity basketball at UBC and worked as a forest firefighter. Since becoming an optometrist, she has participated in third world eye care projects in Myanmar and the Philippines. 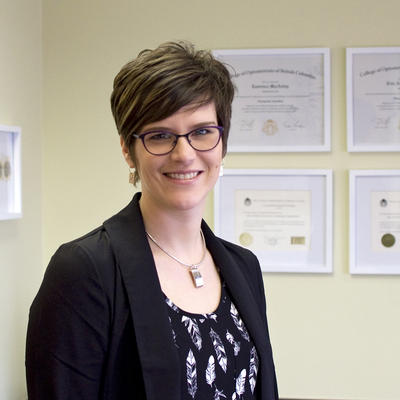 She is currently serving as a Peer Circle Facilitator with the College of Optometrists of BC. She takes pride in providing comprehensive eye health and vision examinations. Dr. Scharf enjoys running, cycling, hiking, Nordic skiing, and ultimate Frisbee. She loves the outdoor life that the North Okanagan has to offer!